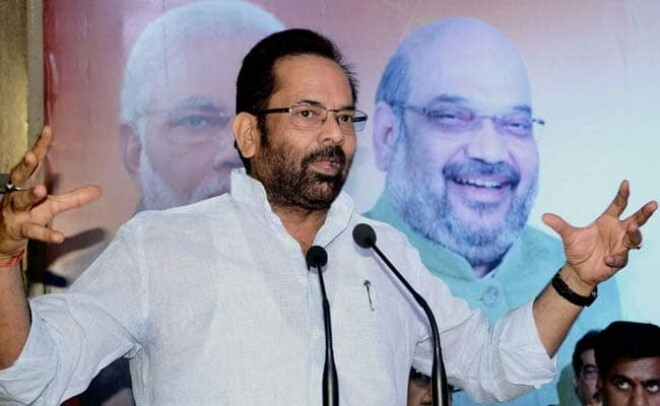 New Delhi, March 4: Union Minister for Minority Affairs Mukhtar Abbas Naqvi on Monday launched a scathing attack on the Congress party accusing them of sympathizing with Pakistan after the Pulwama attack and aerial strikes that claimed the lives of several Indian soldiers. "While the security forces are cracking down on terrorists and their sponsors; the Congress and its supporters are left "screaming'. Is it a coincidence or a jugalabandi? (partnership)," Naqvi said in a tweet accusing Congress of colluding with Pakistan. He further accused the Congress of raising questions on national security. "Congress has become 'Flop Show' of 'PVR' (Priyanka, Vadra, Rahul). Raising questions on national security and creating a ruckus on the development of their own areas; Congress leaders are trying to act on a 'Flop and Expired Script''," he said. Earlier today, citing international media reports of "no proof of militants being killed at Balakot", Congress leader Kapil Sibal on Monday questioned BJP leaders how they could zero down on specific number of terrorists killed there and asked them not play politics with terror keeping Lok Sabha elections in mind.